This page has some of my various belt knives. No matter the shape of the blade, these small knives will make a great EDC or secondary knife for your belt, pack or pocket. This "Viper" model is a full tang belt knife and one of the pieces I wore on Forged in Fire recently. This one is forged from my "ball-bearing smash" pattern damascus consisting of 52100 ball-bearings and 1095 powdered steel. This blade was edge quenched at heat treat and has forge marked/acid soaked flats. The handle scales are A-grade Cocobola Burl wood which are secured by a brass handle bolt that I've done a pre-patina on and matching lanyard liner acting as a second "pin". The knife is finished off with some trade beads as a lanyard fob. This knife has a 2 3/4" cutting edge and an overall length of 6". 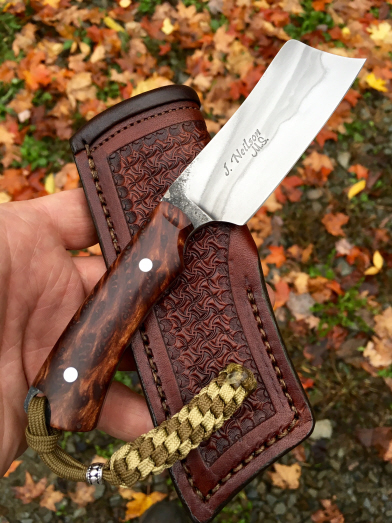 This knife comes with a tooled leather pouch sheath with a clip for pocket or belt carry. 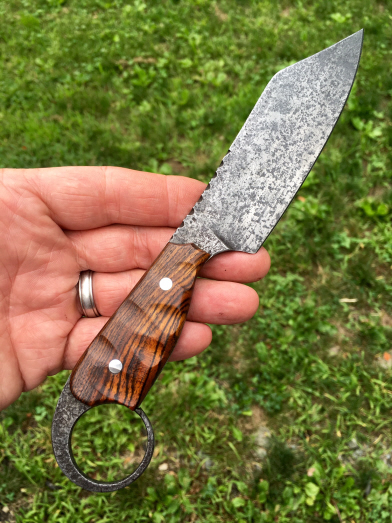 Here is the knife that I carried and used on season 2 of Forged in Fire, not sure how many folks would combine a Norse-style blade with an Asian-style handle but, that's part of the fun for me and it's turned out to be a great combination. This full tang "crossover" knife is forged from high carbon Cruforge-V steel with forge marked/acid soaked flats and my "antiqued" finish for corrosion resistance as well as that "aged" look. This blade has a 4 3/8" cutting edge as well as a file worked thumb rest for comfort and control. The handle scales are top-grade Desert Bacote wood that has been textured for grip and are secured with stainless steel handle bolts. The pommel end of this piece has a forged "finger ring" for a secure grip while being held in a forward or reverse position. 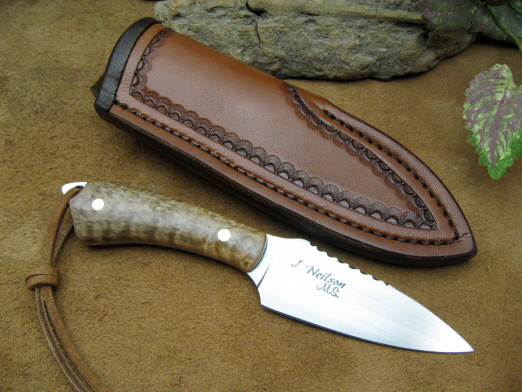 This knife knife has an overall length of 8 1/2" and comes with a tooled leather pocket/belt sheath with a belt loop. I've done several small cleavers over the years but, I think this is my favorite, kind of a cleaver/belt knife cross. This full-tang knife is forged from 1084 high carbon steel and has a 3 1/4" cutting edge along with forge marked/acid soaked flats. The edge-quenched blade has a hand-rubbed finish and is etched to bring out the multiple hamon/quench lines. The handle scales are stabilized, A-grade Redwood Burl secured with stainless steel handle bolts. The handle also has an exposed lanyard hole in the pommel and lanyard fob. This piece has an overall length just a bit over 7" and comes with a fully tooled leather pouch sheath with a belt loop. 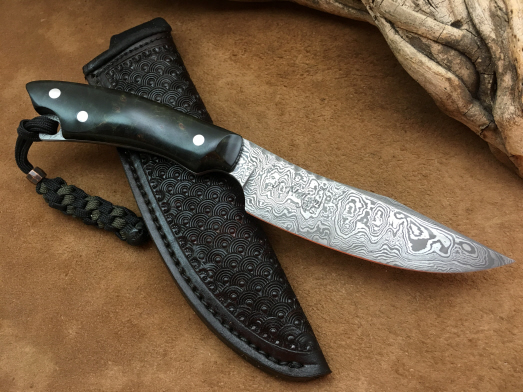 This "sweeping" full-tang Belt knife is forged from 150 layers of "forced random" pattern damascus steel with a false clip and a file worked "thumb drop" spine. 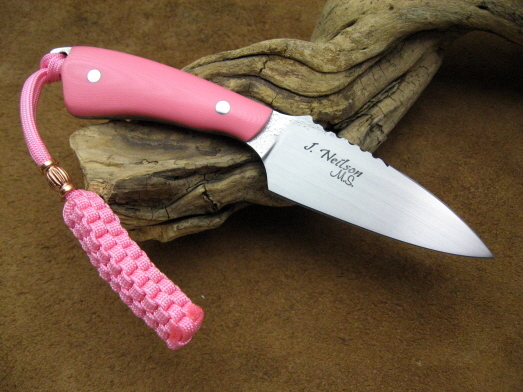 The knife has a 4 1/8" cutting edge and an overall length of 8 1/2". 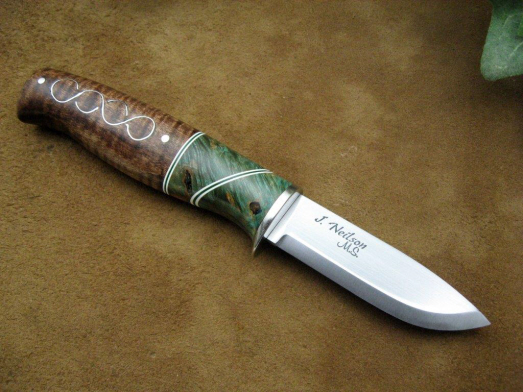 The handle scales are stabilized and green dyed A-grade Maple Burl wood. The handle scales are done in a "palm swell" style and are secured with three stainless steel handle bolts with an exposed lanyard hole on the pommel and a fancy lanyard fob. 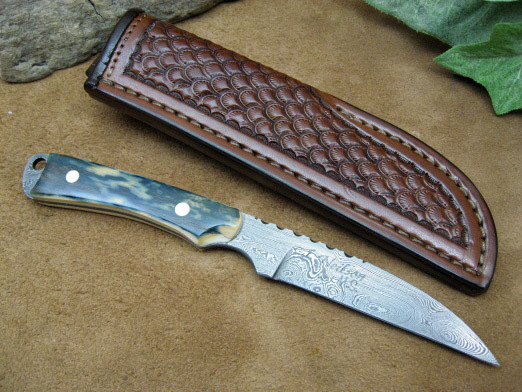 This knife comes with a fully tooled leather pouch sheath. This belt knife is a fun play on a well known cable damascus pattern. Multi-bar construction and folded I call it "Rebecca's Wave". This full tang knife is fully etched all around with a spear-point profile and has a 2 3/4" cutting edge and an overall length of 6". The handle scales are stabilized/sealed California Buckeye Burl secured with a stainless steel handle bolt and lanyard liner. This piece also comes with a fancy lanyard fob and a tooled leather pouch sheath with belt loop. This full-tang combination Belt Knife and Utility Hunter is forged from Cru-forge V high carbon steel. This knife has an overall length of 9 1/4" with a 4 3/8" cutting edge. The blade is a clip-point design with a file worked thumb rest and a forged "ring" for control and stability. 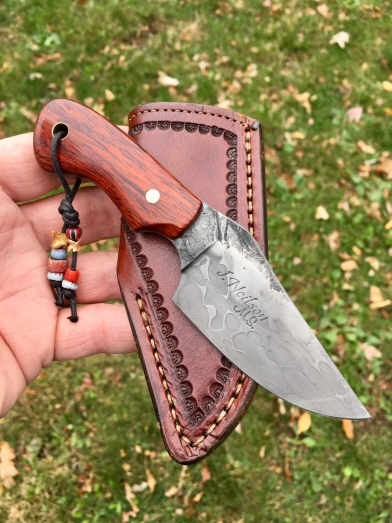 This knife has Exhibition grade Desert Ironwood Burl handle scales done in a "palm swell" design and is secured by stainless steel handle bolts and a matching lanyard liner. This piece also has my "antiqued" finish for a cool look as well as durability and corrosion resistance. This knife comes with an ambidextrous tooled leather "clip" sheath. This was an idea inspired by the request for a large, decorative Cleaver as a gift... I suggested something that could be carried and used daily. Now I can offer the Mini Cleaver for your belt! This smallfull-tang Cleaver is forged from 1084 high carbon steel with an overall length of 6" and a 2 7/8" cutting edge (edge to spine 1 3/8"). This piece has my "antiqued" finish for a cool look and durability and the front edge and "hanger hole" are both beveled. The handle scales are stabilized Buffalo Horn and are secured with stainless steel handle bolts. 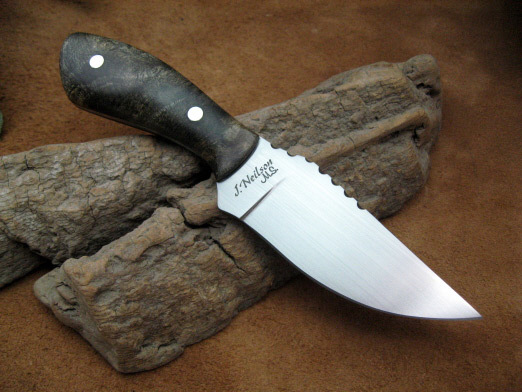 This piece can come with a Kydex belt sheath or a border tooled leather sheath with belt loop. This "Viper" model is a full tang belt knife small enough for belt or pocket carry. This one is forged from W1 high carbon steel. This blade was edge quenched at heat treat and given a hand-rubbed finish before etching to bring out the hamon/quench line. This piece also has forge marked/acid soaked flats and a file worked thumb rest. The handle scales are A-grade Hawaiian Curly Koa wood, done in a "palm swell" style, which are secured by a stainless steel handle bolt and matching lanyard liner acting as a second "pin". This knife has a 2 3/4" cutting edge and an overall length of 6". 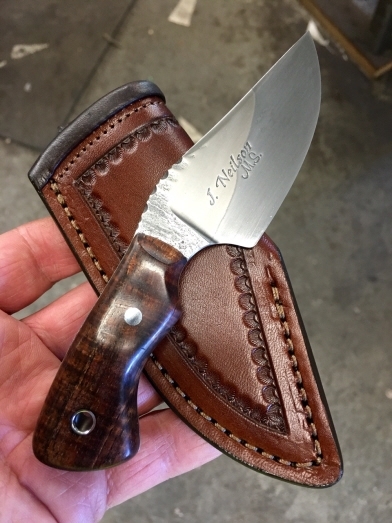 This knife comes with a tooled leather pouch sheath with a clip for pocket or belt carry. 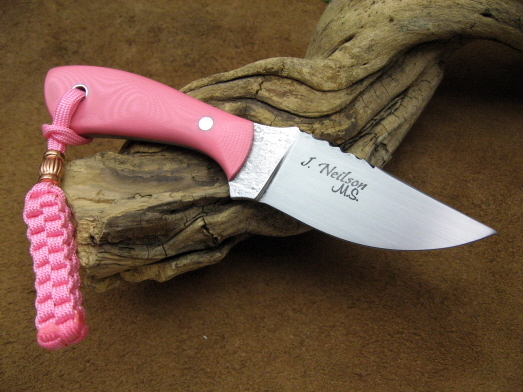 Here is another example of my special addition "Pinkie" belt knives I try to make for Valentine's Day. I have, so far, made these as my BUKs, Simple Swift and Dart models. These have also become popular Cancer Awareness gifts as well. All of these blades match my standard patterns and are forged from 1/8" thick 1084 high carbon steel with visible quench/hamon lines. All have acid soaked and polished "forge marked" flats, hand-rubbed blades and file worked thumb rests. The handle scales are Pink G-10 secured with either a stainless steel pin and lanyard liner combination or stainless steel handle bolts. The "Dart" model on top also has an exposed lanyard hole/pommel tip. The handle scales on the "Simple Swift" are done in a "palm swell" style. All of these knives come with standard Black or Hot Pink Kydex belt sheaths with reversible/removable belt loops and matching paracord lanyard fobs with copper beads by Jodie Johnson. "Dart" model (top) - approx. 7" overall with a 3" cutting edge. "Simple Swift" model (bottom) - approx. 6 1/4" with a 2 5/8" cutting edge. Here is a modification of a couple of my pieces with a bit of a "tactical" flair. This full-tang knife is forged from 1084 high carbon steel with a 5" blade, a Tanto grind and the entire blade has my "antiqued' finish for it's ease of maintenance and non-reflective qualities. The handle scales are black G-10 done in a "palm swell" style and are secured with stainless steel handle bolts. The handle is finished off with an exposed lanyard hole/pommel tip. This knife is approx. 9" overall and comes with a matching black Kydex sheath with reversible/removable belt loop. 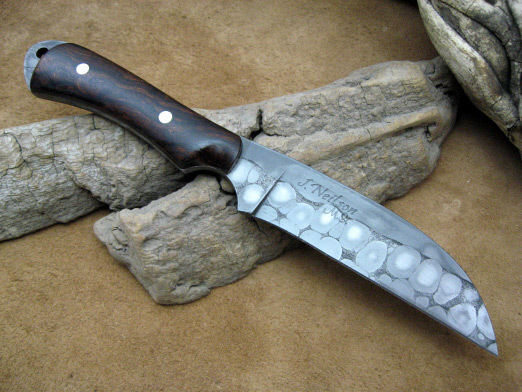 This "Pukko" style knife has a 3 1/4" blade forged from 52100 high carbon steel with hand-rubbed flats and satin finished edge bevel ground to a zero degree edge. The guard is nickle silver. The handle is a combination, in the front half of dyed/stabilized Black Ash Burl and green/white spacers. The back end of the handle is A-grade Curly Maple wood with .999 fine silver wire inlay in a "twining loop" pattern and secured with a pair of stainless steel pins. 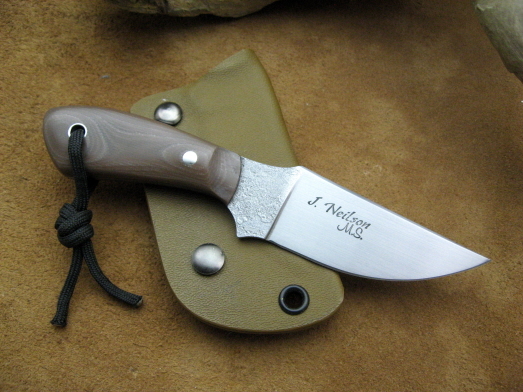 The overall length of this knife is 8 1/4" and it comes with a tooled leather pouch sheath. This knife is just what it claims to be, a smaller and simpler "Swift" design with nice cutting ability in a small package. The knife is forged from 1/8" thick 1084 high carbon steel. The blade has forge marked and lightly etched flats and a hand-rubbed finish on the bevels. The handle scales are Earth Brown G-10 done in a "palm swell" style secured with a stainless steel handle bolt and lanyard liner. The knife is 6 1/4" overall with a 2 5/8" cutting edge. 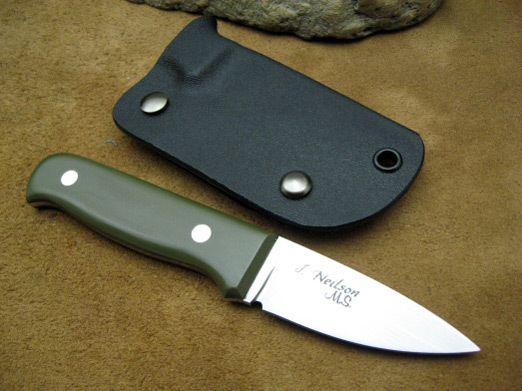 This knife comes with a molded Kydex sheath, also in Earth Brown, with a removable/reversible belt loop. This allows the knife to be carried on the right or left side... or remove the belt loop altogether for pocket or (adding a cord/chain) neck carry. 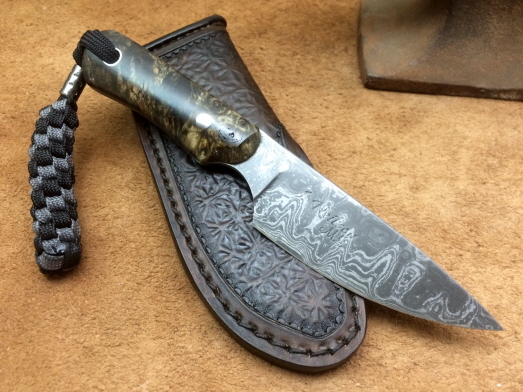 This full-tang "Whisker" pattern belt knife is forged from my high carbon "Ball-bearing Twist" damascus forged from 52100 ball-bearings and 1084 powdered steel done in a canister weld. The knife is 7" overall with a 3"
cutting edge and a file worked thumb rest. 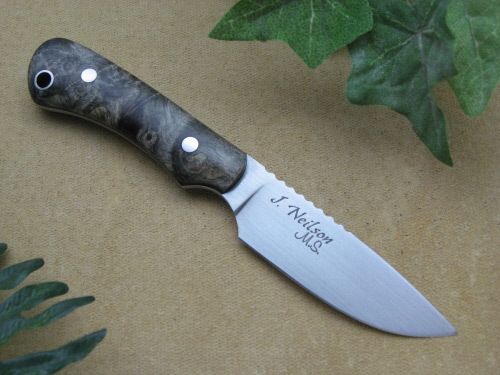 The handle scales are stabilized, dark green Maple Burl wood secured with two stainless steel handle bolts. The knife also has an exposed lanyard hole with a matching lanyard fob. 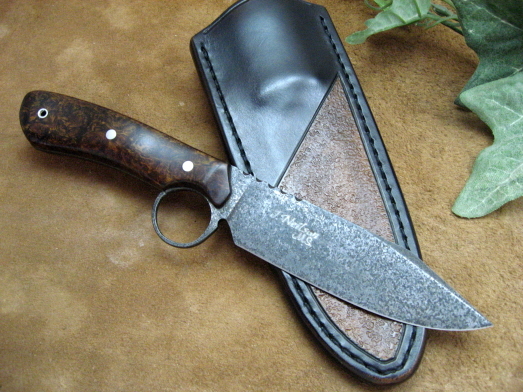 The knife comes with a border tooled leather pouch sheath with a belt loop. This Wharncliff knife is canister forged with the top of the knife being 1095HC and the bottom in my 52100 high carbon Ball-bearing damascus. The knife is 8 1/8" overall with a 3 1/2" cutting edge. This knife has A-grade Desert Ironwood handle scales secured with stainless steel handle bolts. The back has an exposed pommel-end with lanyard hole This knife comes with a fully-tooled leather pouch sheath with belt loop. 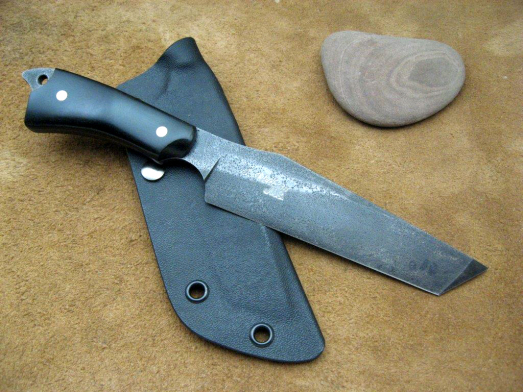 The Rough Neck is a 6" full tang knife (half blade, half handle) with a blade of 1084 high carbon steel. The blade has a hand-rubbed finish and thumb grooves on the spine. The handle scales are stabilized California Buckeye Burl wood with black liners, stainless steel handle bolts and lanyard liner. The knife comes with a tooled leather pouch sheath with belt loop. This Swift belt knife is forged from 1/8" 1084 steel. The knife has a hand-rubbed blade with a visible hamon line and file worked thumb rest. The knife's overall length is 7 1/2" with a 3 1/4" cutting edge. The handle scales are stabilized California Buckeye Burl wood with stainless steel handle bolts. 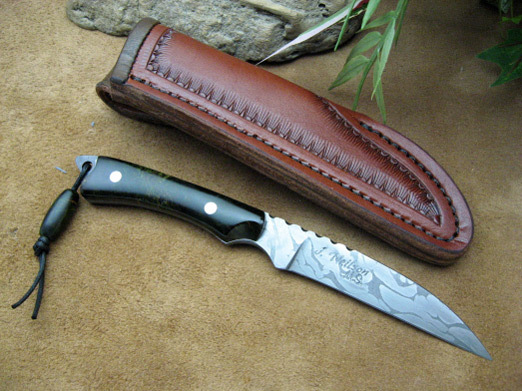 The knife comes with a tooled leather pouch sheath with a belt loop. This Whisker belt knife is forged from 380 layer "random" damascus forged from 52100 & 15N20 high carbon steels. This piece has a 2 7/8" cutting edge with an overall length of 6 7/8". This full tang knife has a file worked thumb rest and exposed pommel/lanyard hole. The handle scales are blue Fossil Mammoth Ivory secured with stainless steel handle bolts. The knife comes with a tooled leather pouch sheath with belt loop. This belt knife has an "arrow" shaped blade and a thumb rise for comfort and control. The knife is made of 1084 high carbon steel with a hand-rubbed finish and visible "quench" line. The overall length is 7" with a 3" cutting edge, 1/8" thick with a file worked back-spine. The handle scales are stabilized Quilted-Curly Maple wood with brass handle bolts and an exposed lanyard hole. The knife comes with a tooled leather pouch sheath with belt loop. This modified little full tang knife is a mixture of a few different styles. The knife is forged from 1084 high carbon steel with a hand-rubbed finish. The knife has a basic, short S-B style but, with a full grind and bevel like one of my belt knives, though it is fully hardened and has a flat spine. The overall length of this knife is 6 5/8" with a 2 1/2" cutting edge. The handle scales are 1/8" thick Olive green G-10 and are secured with two stainless steel handle bolts. The knife comes with a Kydex sheath with reversible/removable belt loop and a thumb push. Price, with Kydex sheath: $450.00.